Apostle Brenda Thomas reminds us to leave the past, along with our old behaviors, where it belongs, behind us. Once the power of God is accepted, understand that you died alongside Jesus and rose again, through the waters with the gifts and guidance of God. This acceptance, allows you to leave the fruit of your carnality behind. Lying, cheating, manipulating, doubt, that's old news. Those behaviors have been buried. The rising and the walk according to the will of God is the promise of ... See More prosperity. So, you get to make the choice. Choose to get up. Think, apply, practice, integrate God and His wisdom in your walk and you will revel in the newness of you through His eyes. 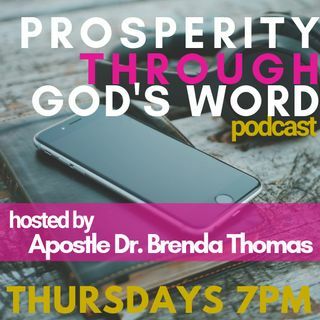 If you enjoy Apostle Thomas' weekly message, please comment below with your thoughts, reactions, feelings & prayer requests. Also, you can share the podcast to continue to spread the God's word.